The Pastors Legacy Ministry (PLM) is a group of area pastors who believe that the local church must take the lead on discipleship. This group meets monthly to share best practices for discipleship, as well as for prayer and accountability. Founded in 2012 by Dr. Ron Ballard and Rev. Delayno Robinson, the PLM holds an annual conference where they gather members from each of the churches they shepherd. 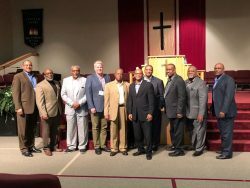 This year’s conference was held on October 5-6 at St. John’s Missionary Baptist Church in Springfield, Ohio. The theme was “Discipleship and the Family.” Dr. Willie Richardson was the keynote speaker and challenged families to live out our their faith. Cedarville University has special ties to the PLM. PLM members Gregory Dyson, William Randolph, Tony McPeters, and Ernest Brown are either graduates, employees, or special advisory board members at Cedarville, and many others have attended special events hosted by the University. PLM’s brochure was designed and printed by Cedarville’s marketing department as well. 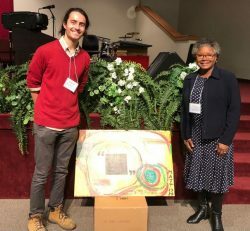 Artist and recent Cedarville University graduate Alex Pa’at ministered with live paintings at the 2018 PLM Conference. The three paintings, along with some ceramic pieces, were given away at the end of the conference. Alex is pictured here with one of his paintings and its recipient, 2013 Cedarville graduate Florence Randolph. To learn more about this ministry community, visit the PLM website.